One of the mods will probably contact you if more info is required. If not, later today, 4.5.8.21 will load. I'm getting mine pushed right now! just wondering if this new firmware upgrade is causing these issues that are worse then before the upgrade.. The problem isn't the data rate or successful single pings. The problem is the latency that is showing up in applications and ingame. If you look at the following ping test to the first node beyond my modem, you can see the second and forth pings, which are high time pings. So, with just 5 pings, my average ping time is 73 ms. In a few more pings, there will be another high time ping or equal or greater time. My average ping time to the first node historically has been 10 ms. Now, if I let this run long enough my average ping time will be 20 to 30 ms with visible high time pings. Consider this, this is the first stop on the road to everywhere, and I'm seeing high return times from that node alone. Fwiw, I'm not the only one to see this in an application or possibly in a game. This is seen thru a CGNM-3552 with V4.5.8.21 running gigabit service out to a Casa CMTS. Its an interesting combination, higher data rates and higher latency. So something is up, so to speak. In order to see this run a trace to anywhere. Then ping the second address in the trace, which is the first node beyond your modem. Run it for something like 100 or 200 pings and just sit back and watch the ping times as they scroll by. You will probably see pings in the 20 to 30 ms range, then some high time ping possibly in the 200 to 300 ms timeframe. If you do this, please let me know what your results are. 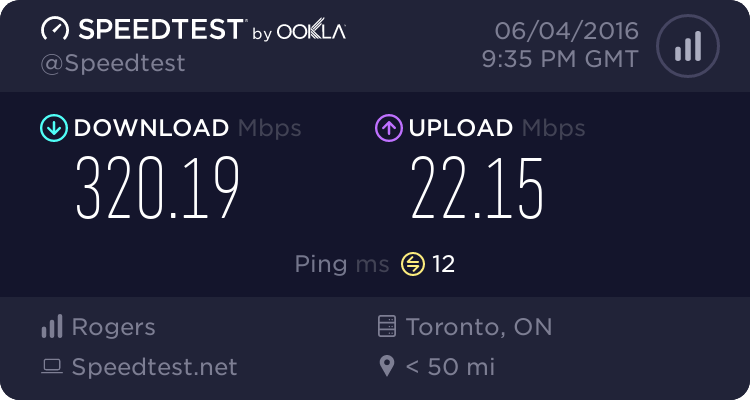 If by some chance you have an average in the 10 ms range, I'll probably ask you to send me a copy of the whole ping test so that I can have a look at it, ping by ping. The maximum number of pings that the command window will hold, so that you can copy it, is 293, despite the fact that the test itself might be much longer. Just as an aside, your signal levels are in spec, but, personal opinion the downstream levels are pretty high. They should be down at 0 dBmV. But, if they aren't presenting any issues at this time, better to let sleeping dogs lie. Over the years that will come down as the external cable ages. kool saw this post and thought i would give it a go...think maybe i might have a problem....did the tracert then used the 2nd ip to do a ping with..
My guess is that you're on a Cisco CMTS at the moment, which is probably set to not respond to pings. Please let me know what CMTS you're on, Cisco or Casa? Ok, can you delete the events log as it has your modem MAC address in it. You're on a Casa CMTS. Its interesting that pinging the second IP fails. What happens when you ping something usual, like google.ca or google.com?